Sister Mary Ward summed up her own life when she said "You can't take me away from boat people. There isn't one of them wouldn't die for me, or one I wouldn't die for". 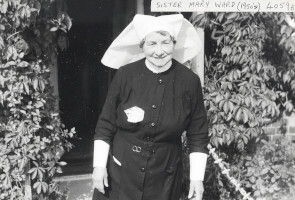 Sister Mary Ward ran a free dispensary for boat people in her own home at Stoke Bruerne until she retired in 1962. in 1944 she was being paid an honorarium of £2 per week by the Grand Union Canal Carrying Company, but nothing by the other carrying companies whose crews used her services. She performed all the services of a trained nurse and also some which should have been performed by a doctor. She worked in the most difficult circumstances with no gas or electricity, no telephone and she had to pay for her own instruments, drugs, bandages, disinfectants and the carriage of drinking water as the village was dependent on well water. In 1951 she was awarded the British Empire Medal for her services to the boating community.